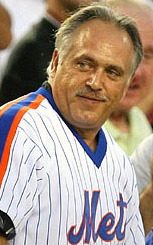 Most New York newspaper sources are reporting that Wally Backman will be returning to the Mets organization as a minor league manager, with the official announcement coming on Tuesday. I had the pleasure of spending a few hours with Wally yesterday afternoon, just talking baseball. He would neither confirm nor deny the news, and since this blog isn’t run by “Scoop” Brady, and doesn’t seek to get a cheap influx of hits by irresponsibly breaking news when I’m asked to sit on information, I’m happy to respectfully wait for Tuesday and therefore wasn’t pressing Wally for confirmation. Instead, we talked baseball — nothing specific, just idle chatter on his experiences as a manager, his thoughts on the game, and some insight on some of the players he’s managed or seen over the past few years. One thing we did discuss was his philosophy in terms of young ballplayers on their way to the big leagues. Wally Backman believes that players can and should learn how to win, no matter the level of play. In his view, learning to win and “development” go hand-in-hand. He eschewed organizations that put a premium on “developing” players, to the point where “development” took precedence over winning ballgames. If indeed Wally Backman is on the verge of re-joining the Mets, and is bringing ideas such as this with him, I have to change my current pessimism into optimism. Hopefully, the Mets are looking to inject more people like him throughout the organization (re-hiring like-minded Tim Teufel is further evidence that the Mets are committed to change — hopefully John Stearns is also on the radar). It may take some time before we as fans reap the benefits of philosophies instilled at the lower levels of the farm system, but at least we’ll know a philosophy that makes sense, and is grounded in success, is in place. Back One Carlos or Two in 2010? The only problem is that a guy like Backman with a clear message isn’t managing the big club. Instead, the big club has a guy who sends false messages to his players regularly, can’t stick with a decision for more than a play or two, and seems to enjoy most, going to the press after the game and making jokes and belittling his players who had a roough game. So, good hire, wrong dugout! Just hinting that Dan Warthen would be falling back on “scare tactics” with his [mentally unstable, or recovering] pitchers in Spring Training this year (to get them to work on throwing more strikes) — you start to get the idea that these guys on the coaching staff are pretty clueless. Manuel was cute for awhile, but showed us nothing last year — at least to state that he’s an ounce better than Randolph was. His team mailed it in on him, during a season that probably should’ve been less than DISASTROUS. Warthen’s pitchers haven’t developed at all; and in some cases, look like they’ve regressed. Don’t get me started on Howard Johnson as Hitting Instructor. It’d be nice to get some true developers employed within the system. Ignoring these types of issues for long periods of time; throw things into reverse…..and it shows in the “results”. 1. this was a great post. I’d like to see you follow Wally next season. no doubt this is an oppurtunity to keep wally out of the pressure cooker and guage his mental health’. There is no reason why he wont be in NY at some point. 2. speaking of Wally backman’s students…how come no one is proposing a look at conor Jackson..is his stock that low?